It is reassuring to know your loved one is cared for by a team of professionals whose goal is to ensure dignity and comfort for our patients and support for the family. Volunteers receive training to assist in a wide variety of ways. Our staff and volunteers are your friends and neighbors who feel it is an honor to be part of this special time of life. Our patient-to-staff ratio is kept low so we can be there when you need us. 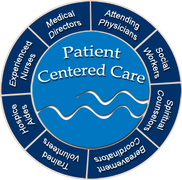 Patients are cared for by a trained interdisciplinary team of volunteers and professionals to help patients and families deal with the physical, psychological social and spiritual issues they are facing.